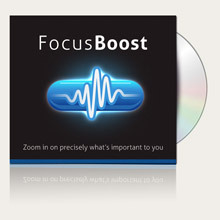 Get in the Zone quickly and easily with this intense brain-centering session. Find your focus and get the laser-sharp clarity you need to stay on task. If you want to be single-minded, driven, and utterly determined to succeed, this is the session for you. 18Hz full-go, it is the perfect accompaniment to any activity that demands 100%.